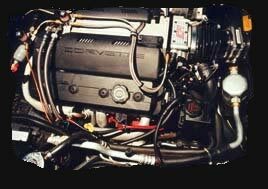 A lot of folks have been sending me e-mail for some more information on my 1995 460 horse power Corvette Convertible. Let me tell you a bit about it. The beast you see below is a 1995 loaded Corvette -- 460 Horse Power. Its a convertible, black on black automatic with built in front and rear laser-radar detectors. It has a Dana 44 rear end and a 3.73 gear. The car has also been lowered 2". The select ride has been modified for heavy duty use. The car has heavy duty sway bars, drilled discs, and the rear axles are narrowed 1.75". The car is equipped with Dymag 5 star style wheels (magnesium) and B.F. Goodrich TA tires -- 315mm x 17" ZR1 tires on rear -- fits like a glove! I installed a set of Brembo 4 piston caliper brakes up front for incredible stopping power with 13" cast iron drilled rotors that haul it down fast and that look awesome!!! The engine is 383 c.i. stroked, bored, ported and polished, Callies crankshaft, Oliver rods, Ross pistons, 58mm throttle body, high pressure intake, MSD ignition and Taylor wires. As well, it has headers long style, cat back Borla exhaust "no cats". This 'vette hauls you right back in the seat! This car has only 8000 miles and is very reliable and smoother than stock. All work was done & parts supplied by Exotic Muscle in Phoenix Arizona. All very professionally done!